Were the sea pirates of the 17th century infringing on copyright? No they weren’t. Weren’t they pirates then? Yes they were. 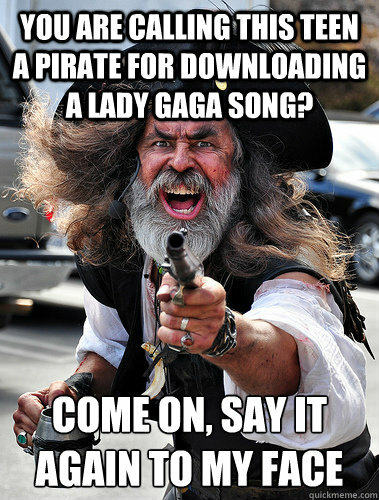 So piracy cannot be reduced to copyright infringement. A core thesis of the book summarized in a short animation is that piracy has been an ill-defined and mischaracterized concept. In a nutshell, we conceive of piracy as a geopolitical tension taking place within uncharted territory and involving three types of social agents: pirate organizations, sovereign states, and monopolistic corporations. The high seas were uncharted territory in the 17th century, and sea pirates of the time were contesting the rules that sovereign European states were attempting to impose on water, via the use of the monopolistic East and West India companies. Similarly, if you conceive of the airwaves in the first half of the 20th century as uncharted territory, you will observe the same pattern: sovereign states attempting to impose their own (broadcasting) rules using monopolies (such as the BBC), while pirate organizations (pirate radio stations) opposed them and proposed alternative norms of exchange. Much of what is going today in cyberspace – an uncharted territory par excellence – can be analyzed using the same lens. Copyright regulations are but one type of rule that is at stake in cyberspace, but there are many more. Reducing piracy to copyright infringement is like reducing the wine industry to the Bordeaux region (and that’s a Frenchman telling you it would be a mistake). Powerful lobby groups have a clear interest in reducing piracy to copyright infringement issues. It makes it easier for them to redefine piracy as theft (of intellectual property). But aren’t proponents of “free culture” sometimes helping them achieve this misleading reframing of the piracy debate by anchoring most of their reflection around the issue of open source and copyleft, when clearly there is a lot more at stake? By focusing the discussion on copyright, cyber-activists run the risk of doing exactly the opposite of what they originally intend: equating copyright infringement with piracy. 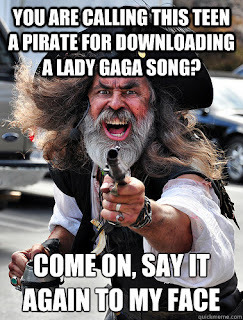 Blackbeard’s crewmembers, who never downloaded Lady Gaga songs from The Pirate Bay, shouldn’t have been hanged after all.